How demographic biases affect prison sentencing was the summer research project for McNair Scholar Gillian Jackson ’18 of Putnam, Connecticut. She worked under the guidance of Kristine Kovack-Lesh, associate professor of psychology. “I felt like she was the person who would push me the most to be the best I can,” Jackson says. 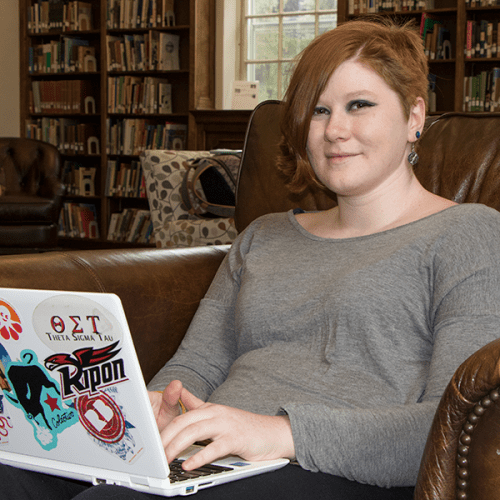 Jackson designed an online assessment that she gave to 300 different people outside of the Ripon College community. The test involved a scenario about a crime, and Jackson manipulated the pronouns to see if it affected the sentencing length. Kovack-Lesh says that during the school year, her research students often are limited in their sample size. However, during the summer, students have the opportunity to strengthen their research. “It allows them to see a more diverse and bigger sample than we could see on our campus,” she says. Jackson says she enjoyed doing research on campus this summer. “One reason I chose the Ripon campus for summer research was because of how beautiful the campus is during the summer,” she says. Posted September 7, 2017 in Faculty, McNair, Research, Student by Jaye Alderson.